This is what I'm thinking about today, in no particular order: 1. Crocuses! Yet another flower that blooms before most others. 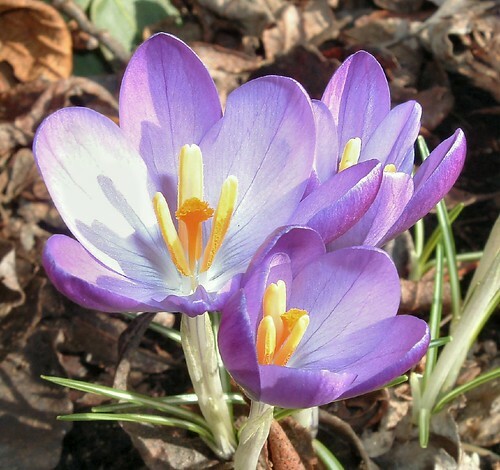 I'm going to try to plant some crocus bulbs and see what happens - you're supposed to plant bulbs in the fall. But last year I planted some in January and most of them grew beautifully and added some nice spring color. I often forget about crocuses (I have some sort of idea in my head that I used to hate them as a child but I can't for the life of me figure out why) but now I think they are pretty and are much more than just Easter flowers. And they're where saffron comes from! So I think if you grew enough crocuses you could harvest their stigmas (three per flower according to wikipedia) and dry them and have saffron! But please no one do that without checking a few other sources since there could definitely be important details that I've missed and I don't want anyone poisoning themselves by eating crocuses. 2. Moving on! I don't often pick up Grid but I actually think it's not a bad magazine and it's definitely good for keeping abreast of environmental/gardening goings on. And here's what I saw today: a workshop this weekend on gardening on your roof! I've always been curious about gardening on roofs - we have a flat section of roof that would be great for a garden. Unfortunately, the roof is leaky and since I do not own my house I'm reluctant to do something that could cause the whole roof to fall in, but it's definitely an idea I've stored away for the future. As the above link points out, green roofs are really good for lots of things, from rain runoff to temperature control for both your house and the surrounding area. Win win! I'm not going to this but I'd thought I'd share in case anyone is interested. Do let me know if you go! 3. Lastly, I'm having a bit of trouble and am wondering if anyone could help. That reads like I'm about to say something very personal and slightly embarrassing, but actually this is about my CSA. Ha! I signed up for the Greensgrow winter CSA which started back in December. I really like it! I went in on a Lancaster Farm Fresh CSA share (with three other people) when I lived in West Philly about five years ago but even though I was only getting a quarter of a share each week I still struggled to eat all those veggies. But it was also awesome because it forced me to eat weird vegetables that I wouldn't have tried on my own and definitely made me eat healthier. The Greensgrow CSA is every two weeks and comes with milk in a returnable glass bottle (YES), a different cheese every time and a choice of dairy (Pequea Farms yogurt, which is easily the most delicious yogurt I've ever tasted, a dozen eggs, butter or tofu.) I've tried to eat everything each time but I'm failing. Last Saturday we got acorn squash, onions, carrots, kale, beets and more that I can't think of right now. We roasted the squash and sauteed the kale with garlic and onions and ate some carrots with hummus and have yet to do anything with the beets and the rest of it. When I looked at the languishing veggies this morning, the carrots were shriveled into little orange witch fingers (you know what I mean?) I'm doing this with my boyfriend so it's two of us eating and it's still hard. Does anyone have any tips? I seem to end up getting home from work starving and staring at some root vegetables that I'd have to roast for an hour and end up eating something like tortilla chips instead. We're going to try planning some meals (something we both loathe but maybe this will be some sort of good lesson or something) and also picking up things like bread and meat to make more complete meals. I should note that Greensgrow has a meat option but with my previous CSA experience I assumed it would be pounds and pounds of meat and I don't even like meat that much. Turns out its a very reasonable amount of meat...next time. So...any tips? Other than "be less lazy" cause I already know I have to do that.